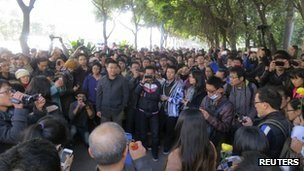 Journalists at a major Chinese paper, Southern Weekly, have gone on strike in a rare protest against censorship. The row was sparked last week when the paper's New Year message calling for reform was changed by propaganda officials. Staff wrote two letters calling for the provincial propaganda chief to step down. Another row then erupted over control of the paper's microblog. Supporters of the paper have gathered outside its office, reports say. Some of the protesters carried banners that read: "We want press freedom, constitutionalism and democracy". "The Nanfang [Southern] Media Group is relatively willing to speak the truth in China so we need to stand up for its courage and support it now," Ao Jiayang, one of the protesters, told Reuters news agency. Police were at the scene but "security wasn't tight", a former journalist of the Southern Media Group told the BBC. "They tried to ask those holding placards to show their ID cards," he said, adding that many had refused although "there wasn't much argument". People were continuing to arrive by mid-afternoon when he left the scene, he added. If the Southern Weekly strike continues for any length of time, this scandal will create a major headache for China's new leader, Xi Jinping. Since he took the reins of power in Beijing, Mr Xi has generated kudos for his seemingly laid-back, open style of leadership. But the Southern Weekly uproar will force him to reveal his hand when it comes to censorship. Will he support Tuo Zhen, the zealous propaganda chief who ignited the fracas at Southern Weekly by censoring its editorial message? The highly-popular newspaper has experienced run-ins with government censors in the past, but its stellar reputation has also allowed it to publish hard-hitting reports on a wide range of sensitive topics, from working conditions at Foxconn factories to the spread of HIV in China's rural areas. Other major Chinese media outlets have been forced to toe the government line in recent years, leaving Southern Weekly unrivalled in its pursuit of top-level investigative journalism. If Mr Xi allows Southern Weekly's special status to be wiped away, he risks tarnishing his carefully cultivated reputation as a humble man of the people. Southern Weekly is perhaps the country's most respected newspaper, known for its hard-hitting investigations and for testing the limits of freedom of speech, says the BBC's Martin Patience in Beijing. Chinese media are supervised by so-called propaganda departments that often change content to align it with party thinking. The row erupted after a New Year message which had called for guaranteed constitutional rights was changed by censors into a piece that praised the Communist Party. In response, the newspaper's journalists called for the Guangdong propaganda chief's resignation, accusing him of being "dictatorial" in an era of "growing openness". In two open letters 35 prominent former staff and 50 interns at the paper demanded Tuo Zhen step down, saying the move amounted to "crude" interference. On Sunday night, a message on the newspaper's official microblog denied that the editorial was changed because of censorship, saying that the "online rumours were false". The microblog updates, said to have been issued by senior editors, sparked the strike among members of the editorial team who disagreed with the move, reports say. Almost 100 editorial staff members have gone on strike, saying the newspaper is under pressure from authorities. Southern Weekly - weekly paper with 1.6m circulation, based in southern province of Guangdong. Seen as influential and daring, but like all China's media, it answers to the ruling Communist Party. Hu Chunhua - newly appointed Communist Party chief of Guangdong province, and touted as a future leader of China. Will be tasked with resolving the stand-off. "Not since the time of reform and opening up and the founding of China has there been someone like Tuo Zhen," Yan Lieshan, a retired Southern Weekly editor, also told Reuters. It is thought that this is the first time that there has been a direct showdown between newspaper staff and party officials, our correspondent adds. In an editorial on Friday referring to the row, the state-run newspaper Global Times said: "The reality is that old media regulatory policies cannot go on as they are now. The society is progressing, and the management should evolve." However it also pointed out that "no matter how the Chinese media is regulated, they will never become the same as their Western counterparts". "The only way that fits the development of Chinese media is one that can suit the country's development path," it said. Searches for "Southern Weekly" on the Twitter-like weibo were blocked on Monday, according to reports. Some influential Chinese journalists have had their social media accounts deleted in recent weeks, Agence-France Presse news agency says. When asked about the issue with Southern Weekly at a regular press briefing last week, a foreign ministry spokeswoman said that is "no so-called news censorship in China". How the case is handled is seen as a key test for Chinese officials, installed just two months ago in a once-in-a-decade leadership transition, observers say. As China develops and the middle class gets stronger, calls for more freedoms are inevitable. When will it be a fully-fledged democracy? 10-15 years I reckon. Just think . . . no more news . . .we could get rid of the BBC . . we would all be better off . . no more £450,000 payoffs to fat-cat senior BBC executives . . . it might spell the end of a growth industry . . . but the world would be a happier (and perhaps a safer) place . . . no more copycat violence, or riots or mass murders. Censorship is necessary - long live PRC and press censorship. Wow. Just imagine UK journalists going on strike over censorship. Fortunately we have the internet. So does China, but it's heavily controlled. Just be thankful for free speech and the ability to criticize our leaders. I'ts been said that the greatest sin a Chinese government can commit is to lose control. Why? because whenever it's happened in the past millions have died. Which do we prefer: a stable society, however oppressive; or democracy, however murderous in reality? It will be interesting to see how the Communist Party maintains it's tenuous grip on power in the face of growing calls for press freedom. Without propaganda the CPC will find it increasingly difficult to maintain control over an increasingly well educated and politically active populace. I can easily see the younger generation calling for change within the next decade or possibly two.